What an amazing experience! 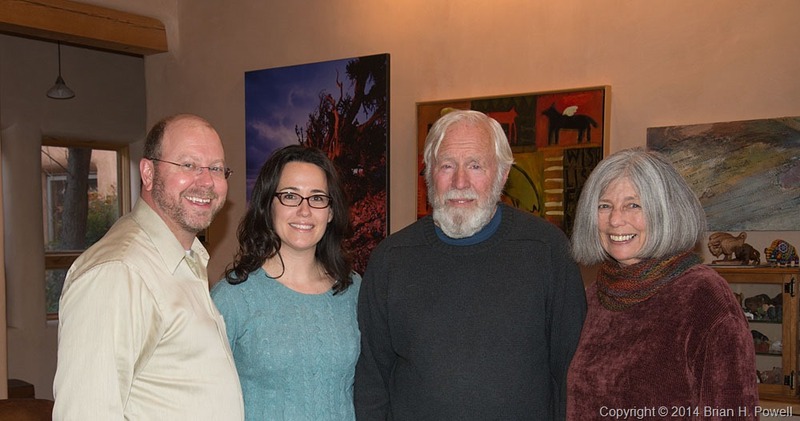 Yesterday, my friend Nicole and I were fortunate to spend a day in New Mexico with the great nature photographer David Muench and his wife Ruth. We were recording an oral history of David for the North American Nature Photography Association. I got up half an hour earlier today to try to get a decent spot to set up my tripod and camera just south of the “flight deck” area at Bosque. It was still crowded with dozens of photographers, just like the day before. I’m not complaining, mind you; just remarking. 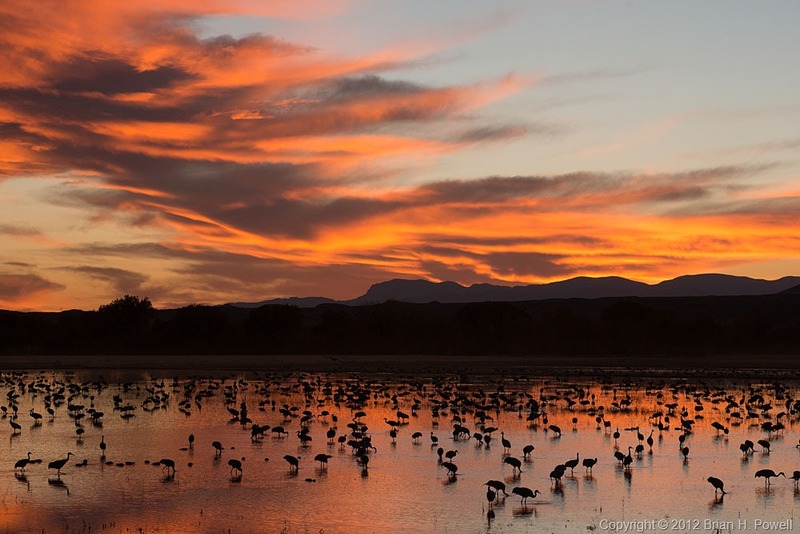 I think it’s wonderful that (1) some great pro photographers are making money holding workshops, (2) Bosque is making money through the entrance fees, and (3) people are excited enough about bird photography and the refuge to visit and spend time there. The sunrise colors weren’t that spectacular today; I’ve seen much better. So, I decided to try for something different. There were a bunch (tens of thousands) of snow geese in the water, and I knew that sooner or later they’d all blast off. I envisioned a shot similar to one I’d done before with a relatively slow shutter speed, to blur the birds taking off. I switched to a shorter (80-200) lens, and waited. And waited. Finally, the birds went, and I started clicking the shutter. Here’s one of the photos, using a shutter speed of 1/3 second. I really like how the birds in the foreground are relatively still while the birds in back are taking off. By the end of the sequence of photos (not shown here), there are no birds left in view. I spent almost the whole day at Bosque today. I continue to sort out where I should be at different times of the day. Sometimes I feel like there’s one “best answer” for where to be at any point in time. But of course, there are a lot of “best answers”. A lot of people are visiting Bosque right now, and I see a lot of photographers crowding together for the same view. I was apparently late getting into place before dawn this morning, and had to squeeze in among a few dozen other photographers at one spot to see what there was to see. After a few minutes, I recognized that there were better photos to be made elsewhere, and I moved on to have a great morning at the crane pools. Almost no clouds today, and morning temperatures in the high teens. At the end of the day, I was reminded once again that there are a lot of options for photos here. There weren’t many clouds, but I was hoping for a little bit of color in the sky at sunset. I was waiting at one of the crane pools when I heard a voice behind me say, “Brian, you’re facing the wrong way”. I turned around to see Artie Morris and the rising full moon. The cranes were flying in, and it was just a matter of time before one flew in front of the moon. I said to myself, “okay, Artie, you’ve convinced me”, and I turned my camera around and decided to go for that shot instead. Artie is a great teacher; you can learn a lot by just hanging out with him. Santa Fe, New Mexico, is one of my favorite cities. Great for photography, great for shopping, great for opera, great for relaxing. 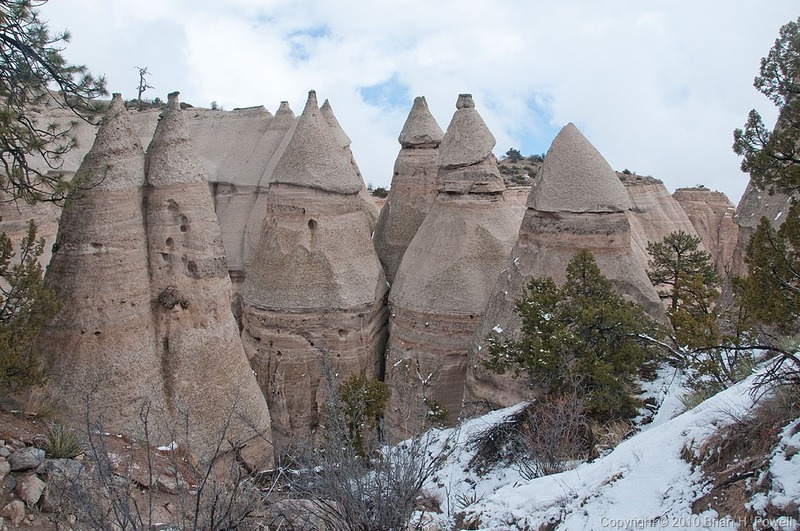 After visiting Kasha-Katuwe Tent Rocks National Monument, I drove up to Santa Fe for an afternoon. 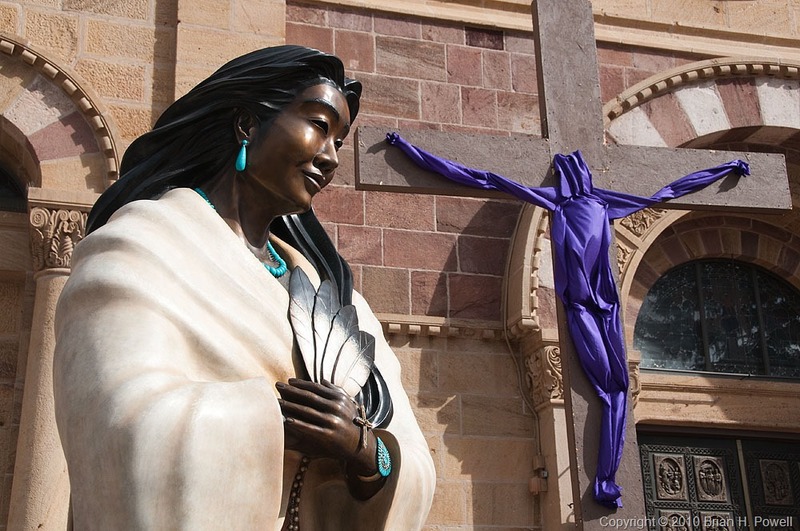 It was the Christian season of Lent, and the St. Francis Cathedral had a figure of Christ on the cross in purple fabric. In the foreground is a statue by Estella Loretto. 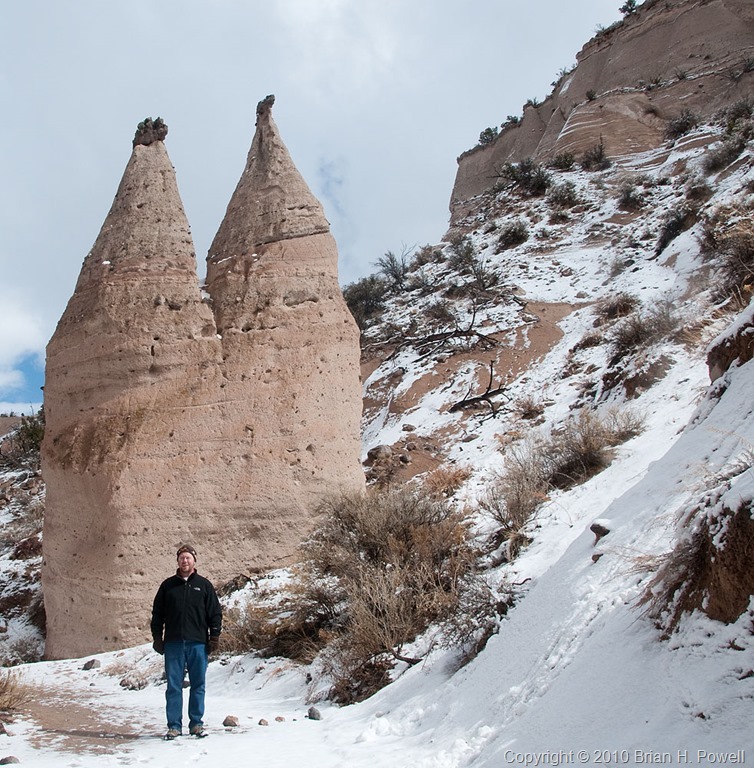 I recently enjoyed a great visit to Kasha-Katuwe Tent Rocks National Monument. It’s between Albuquerque and Santa Fe, New Mexico. This monument is famous for its rock formations, but I didn’t really know what to expect. From the moment I drove up to the gate, I felt welcomed. “Thanks for coming here!”, said the ranger—I think because he was proud of this place. I visited the day after a snowstorm came through. Perhaps because I grew up reading Arizona Highways, I think that snow in the desert is a beautiful thing. 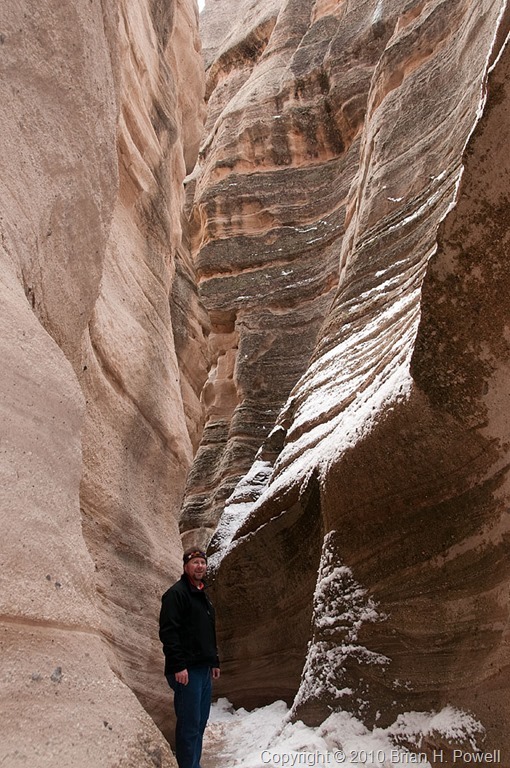 Here are a couple of self-portraits, giving you an idea of the scale of the rock formations. I’ll be back, I’m sure. The day after Thanksgiving, I picked up a rental car and started driving to Socorro, New Mexico. This was an 11-hour drive, but I had committed to picking up my friend Jennifer from the Albuquerque airport about 10 AM on Saturday. The rental was a Kia Sorrento SUV, big enough to hold a bunch of photo gear. I was thankful that the price of gas had fallen well below $2/gallon, and that the SUV managed about 20 mpg. 5:00 AM. Time to get up and start three and a half days of intense, frustrating, yet relaxing, bird photography at the Bosque del Apache National Wildlife Refuge, south of Socorro. It wasn’t long before I saw one of my photography mentors, Arthur Morris. Artie is arguably the world’s greatest bird photographer. He leads photo tours all around the world. He’s sometimes a little rough around the edges, but a very good teacher. You can learn a lot from Artie just by being nearby as he yells advice to his workshop students, and as he weighs the options to keep shooting or move on to another spot. I also recommend his book, The Art of Bird Photography II, a 916-page book for which I did a thorough editorial review. I also saw a couple of other pro photographers I know, Robert O’Toole and Larry Ditto. Larry lives down in McAllen, and had his own workshop group at Bosque. I first met him on a trip to the cloud forest near Gómez Farías, Tamaulipas, Mexico. I also introduced myself to another pro I recognized, Laurie Excell, leading her own small photo tour. My friend Jennifer and I first met on a photo workshop in Utah a few years ago, and we’ve stayed in touch and done other photo adventures together. She’s an oncologist at the Dana-Farber Cancer Institute, and an assistant professor at the Harvard Medical School. Rounding out our trio was my friend Nicole, a great photographer and one of my best friends. It’s kind of hard to see here, but the moon, Venus, and Jupiter are all in the sky on this Monday evening. Here’s a silhouette of my friend Nicole, as we tried to hold on to the last bit of light. 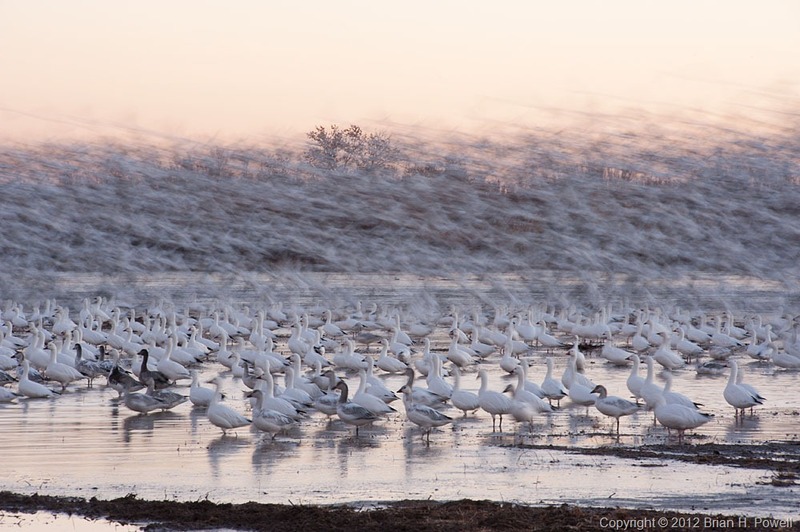 This next shot is with an infrared fisheye, pointed straight up as snow geese flew overhead. 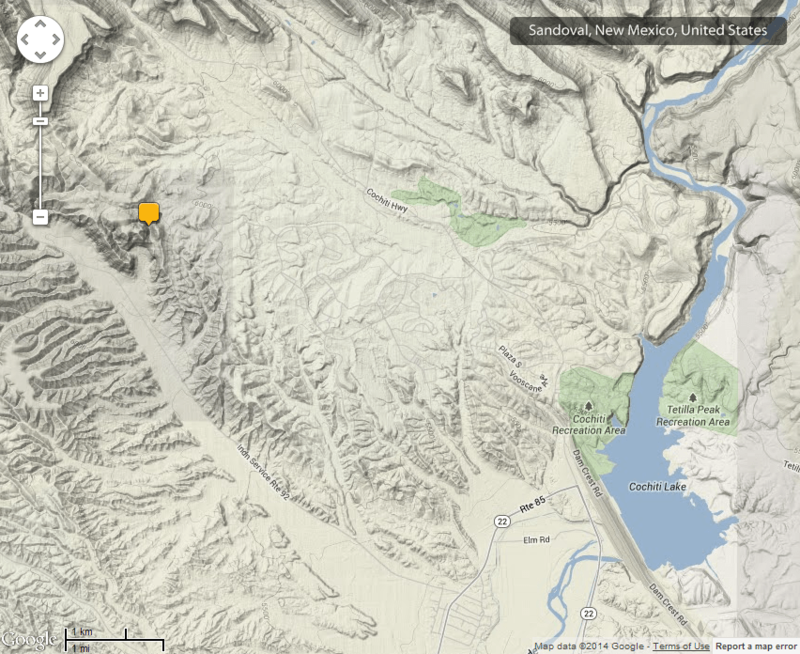 You can see a bit of the ground at the corners. Tuesday morning, we were up for one final dawn photo shoot, then back to the hotel to check out, and off to Albuquerque. I dropped Nicole and Jen off at the airport, and drove on to a work meeting in Albuquerque.